Glasgow Airport is now benefiting from a state-of-the-art radar system upgrade as a direct result of a new nearby onshore wind farm. Due to go live in by the spring of 2019, Banks Renewables’ Kype Muir Wind Farm near Strathaven, South Lanarkshire is a 26-turbine ultra-efficient development with the capability to generate up to 88.4MW of clean, green electricity – making a major contribution to the Scottish Government’s target of renewable sources generating the equivalent of 100 per cent of Scotland’s gross annual electricity consumption by 2020. A key aspect of the planning process for Kype Muir was to provide a solution for the air traffic control systems at Glasgow airport, situated around 28 miles from the site. Current systems are unable to differentiate between the “radar signatures” of moving turbine blades and those of aircraft. Now, thanks to the implementation of a solution by Terma System, Glasgow has become one of just a handful of UK airports benefiting from this advanced level of radar technology. 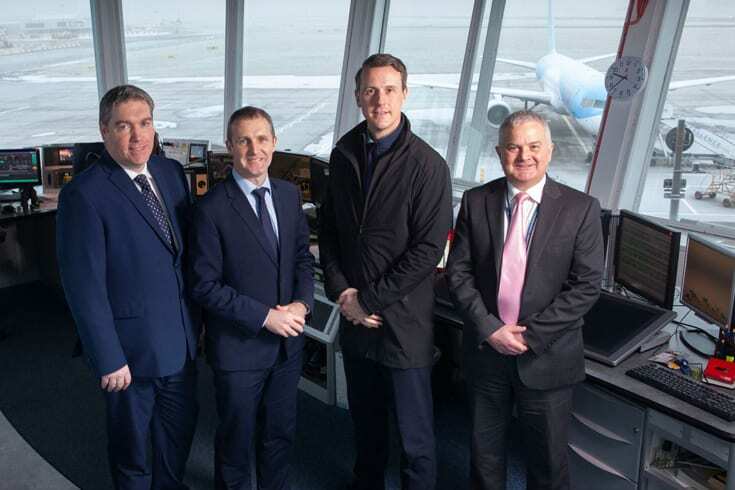 The system was recently installed at the facility operated on behalf of the airport by National Air Traffic Services (NATS) and opened by Michael Matheson MSP, SNP, Falkirk West and Cabinet Secretary for Transport, Infrastructure and Connectivity, in the Scottish Government, on Thursday 31 January. Speaking on his visit, the Minister said: “It’s great to see Glasgow Airport hosting the launch of this new radar system, which is a significant development for aviation safety. Andrew Liddell, technical director with Banks Renewables, said: “We’re especially thankful to Glasgow Airport for engaging with us to deliver the new radar. “This means that not only will our new wind farm stay clear of any radar detection – but other new wind farms may also benefit from this regional solution. Kype Muir Wind Farm will soon become the latest Banks Renewables project to go live in Scotland, weeks after the nearby Middle Muir Wind Farm. These two wind farms have increased Banks Renewables generating capacity from up to around 83MW to around 224MW. Central to both projects has been the focus on the local community – formalised by the Connect2Renewables (C2R) charter. The C2R charter was launched in 2014: It is an initiative between the local communities, Banks Renewables and South Lanarkshire Council which seeks to maximise the social, economic and environmental benefit of the development to the local area. The C2R charter received cross-party support on launch, and will ensure that Kype Muir delivers an estimated £101million boost to the local economy over its 25-year operating period. The charter commits Banks Renewables to using local firms throughout the process – and Banks has already awarded 40 contracts to nearby companies – including the major lead contractor contract, which went to RJ McLeod. In addition, through a carefully planned job and training scheme, the C2R initiative will also provide a range of educational and work opportunities, to help local people find work and in turn boost the local economy. Banks Renewables is now looking to further increase the amount of clean, green, electricity it supplies to the National Grid, and contribute towards the Scottish Government’s target of renewable sources generating the equivalent of 100 per cent of Scotland’s gross annual electricity consumption by 2020, by developing its Kype Muir Extension and Lethans wind farms. Banks Renewables Kype Muir Extension Wind Farm will generate up to c75MW when it is built and Lethans Wind Farm would generate a further c88MW. So together these on-shore wind farms would add another 163MW of clean renewable energy to the grid.